Unibet bookmaker is a top-quality Swedish-controlled bookmaker, founded in 1996, with more than 450 employees, headquartered and licensed in Malta (since 2000). Unibet belongs to the group of largest online bookmakers in Europe, with the Scandinavian region, Netherlands, Belgium and France being its crucial markets. It also has an increasingly growing cutomer base in the UK and the German-speaking countries. The bookmaker deserves particular credit for European Sportsbetting Operator of the Year 2006, 2008 and 2009 titles awarded by the prestigious eGaming Review. Unibet is also among the twelve leading gaming companies in Europe with a membership in the European Gaming and Betting Association (EGBA). The Swedish operator is also a member of Remote Gambling Association. The Unibet Group is listed on the OMX Nordic Exchange in Stockholm. As for today Unibet has more than 10 million active clients from 150 countries of the world. Two years ago Unibet bookmaker company purchased another bookmaker Bet24. Unibet was established in 1996 as a small UK based bookmaker which took bets over the telephone. In years that followed, Unibet has developed into a company which at present can boast over 650 employees and 10 million customers in more than 150 countries. Unibet has strengthened its bookmaking position in Scandinavia by acquiring Maria Holdings, the largest online bingo operator in the Nordic market, and Travnet (Swedish harness racing), in 2007 and 2008 respectively. 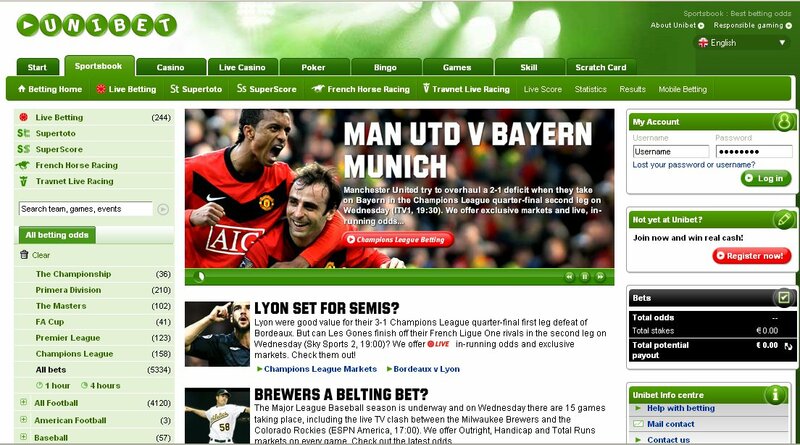 Unibet.com contains a comprehensive sports betting section which covers more than 50 different sports. Apart from the usual disciplines (e.g. badminton, soccer, football, floorball, handball, trotting, golf, cricket, plus exotic pesapallo – a Finnish variation of baseball) and live betting (about 80 events every day), the betting offer includes such unique options as: superscore (predicting the correct score of the 3 matches on a coupon), supertoto (soccer-lottery coupons), Swedish trotting (via the Travnet Live Racing platform) and French horse racing. English football was the most popular betting market for Unibet's customers in 2009 with 17 million bets accepted. Additionally, since 2009 Unibet offers live sports streaming that adds a whole new dimension to in-running betting. In 2009, the online bookmaker streamed 4 500 live events out of the total 21,000 live betting events offered. Growing all the time, sports-streaming now covers 450 live events per month (almost 15 matches each day). Unibet.com also includes online gaming in the form of great live casino (European Live Gaming Operator of the Year 2009 at EGR Awards), casino (over 140 casino games), games (more than 60 games), poker and scratch cards. Intending to appeal to female players, Unibet has also launched three gaming services with women-oriented web design and, each of them in 28 languages: remarkable Mariabingo.com (e.g. social chat, variety of great fun games, lots of innovative features) in 2006, later on Mariapoker.com (e.g. great poker school) and Mariacasino.com (e.g. great games galore). Unibet bookmaker is involved in different sponsorship activities. In the 2008/2009 Primera Division season the company's logo was featured on Valencia football club playing kit following a sponsorship deal with the Spanish side. As for the 2009/2010 season, Unibet has become the sole sponsor of the team from Estadio Mestalla. Also involved in poker sponsorship, the company runs Unibet Open, a series of poker tournaments in Europe, which so far was hosted in Warsaw, Madrid, Milan, Budapest, Algarve and London, and in the past it sponsored Poker TV shows in the Czech Republic and Hungary. Unibet's smaller football partners include Romanian Rapid Bucuresti, Žalgiris Vilnius (very popular Lithuanian football club), Ferencváros Budapest (famous Hungarian football club), as well as JK Nõmme Kalju, Estonian football club. Since 2009, Unibet has also been the titular sponsor of the Polish football second division 1. League. Because of the the adoption of the Act on Games of Chance by the Polish government, the cooperation on sponsoring the Polish 1. Liga has been suspended in March 2010. In 2012 the Scandinavian bookmaker became the main sponsor of the Belgium football club Standard Liege. That same year Unibet signed a partnering agreement with two football clubs of the Dutch Superleague – Copenhagen and Midtjylland. Will the Mexico goalkeeper be able to hold up the Flying Dutchman?